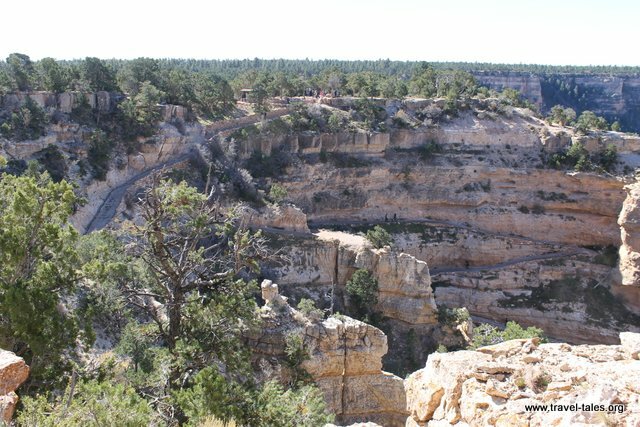 The second day I explored the eastern side of the south rim, taking one of the free shuttle buses out the most easterly point and walking back a couple of miles along the paths created by the National Park Service. No bottled water is sold anywhere in the Grand Canyon National Park. Instead, refillable bottles are for sale and there a number of water filling stations at which bottles can be refilled with Grand Canyon Spring water. It is very tasty water. Before the train arrives, the trails are relatively empty. I kept telling myself that the couple I had been sitting next to on the train were booked back to Williams on the train in the same seats as on the way up, so if I was to slide off the edge of the canyon from an empty path, they would raise the alarm when I didn’t rejoin the train at 3:30 that afternoon. You will have gathered that I didn’t fall of the side of the canyon and only walked down to the first switchback of the Kaibab Trail, the other route from Grand Canyon Village to the Colorado river. I did meet a team from International Hawk Migration Watch. A group of volunteers spends a few months a year living at the edge of the Grand Canyon counting the number of hawks migrating from the north side to the south and onward to their winter homes.